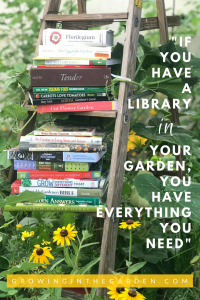 The sunny warm days and cool nights of April are just about perfect for the garden and the gardener. 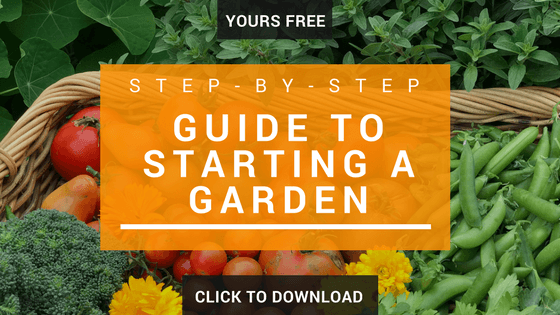 However, this is not the time to procrastinate – warmer temperatures are coming and it’s important to prepare the Arizona garden in April for the hot summer ahead. Although our “April showers” come earlier in the year, the message is a good one. 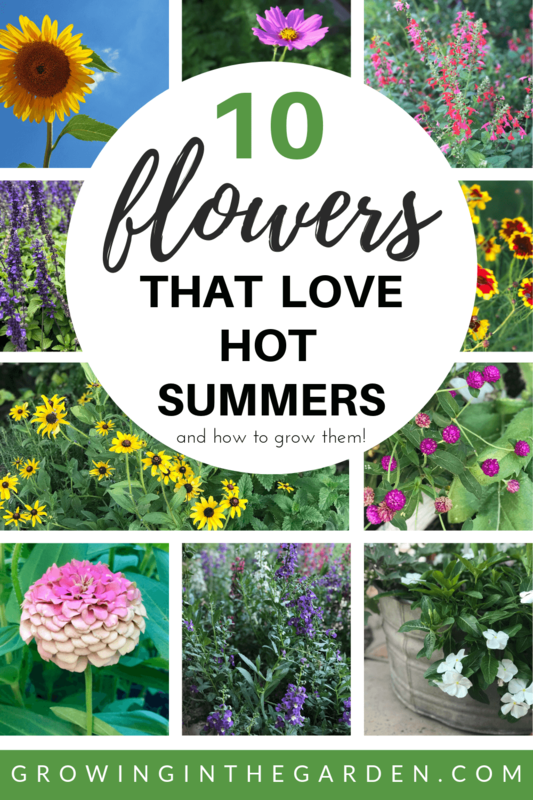 What you do in your Arizona garden in April will affect how your garden, herbs, and flowers withstand the heat of the upcoming summer. We garden year-round in Arizona, but we can’t grow everything all year. 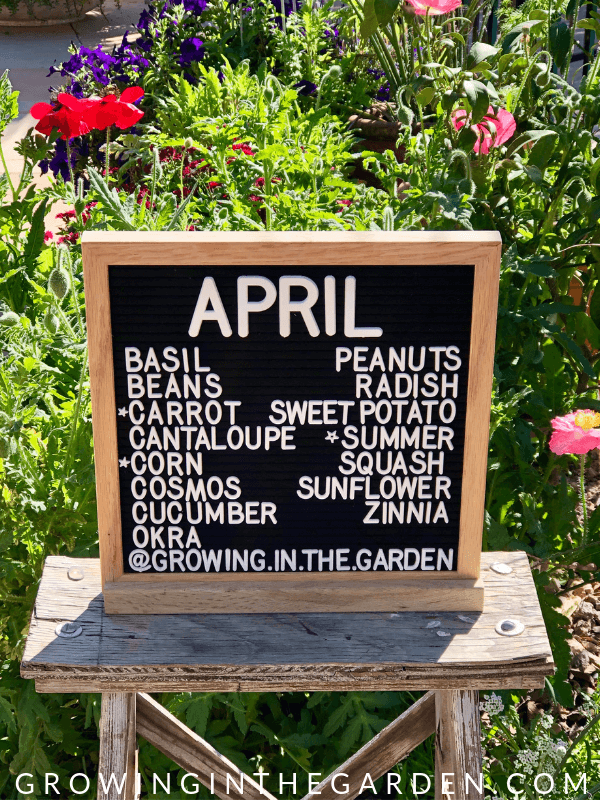 Take a look at what’s growing in my Mesa, Arizona garden this month, and see my list of which garden tasks to do and a list of the vegetables, herbs and flowers to plant in your Arizona garden in April. 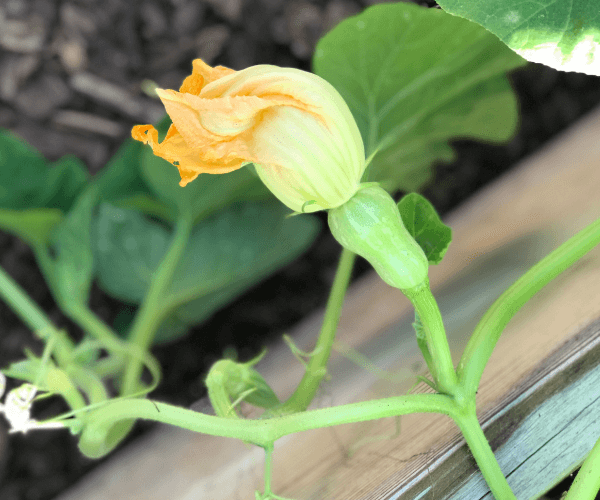 Winter squash (butternut pictured here) that was planted in March is beginning to grow and bloom. Plant summer squash through the middle of April. 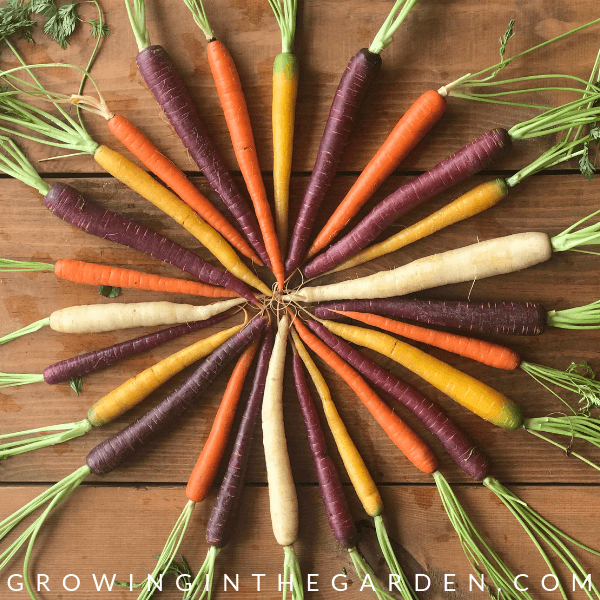 April is a great month for harvesting carrots planted in the fall. 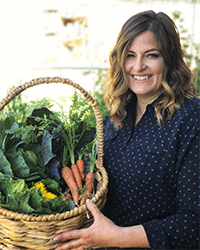 Leave carrots in the ground until ready to eat, but harvest carrots before the heat of the summer if you live in hot places like Arizona (the heat can turn them bitter). A tip to remember — the shorter-variety carrots are best eaten fresh, while longer carrots are more suited to storing. Bean seeds do best when sown directly into the soil. 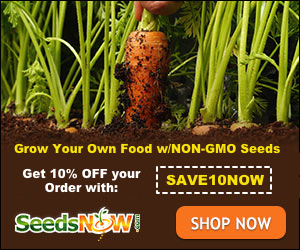 Plant bean seeds 1 inch deep, and space them 2 inches apart. Beans should sprout in 5 to 10 days. 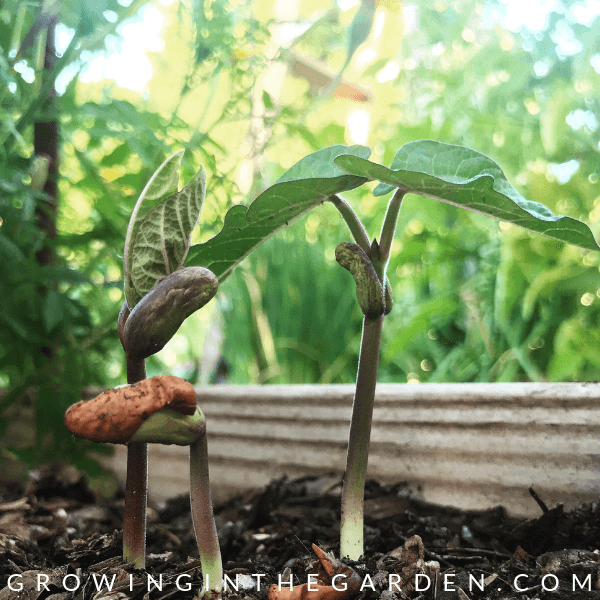 Like many other garden plants, beans need plenty of sun to grow properly. Keep soil moist and well-drained for happy beans. 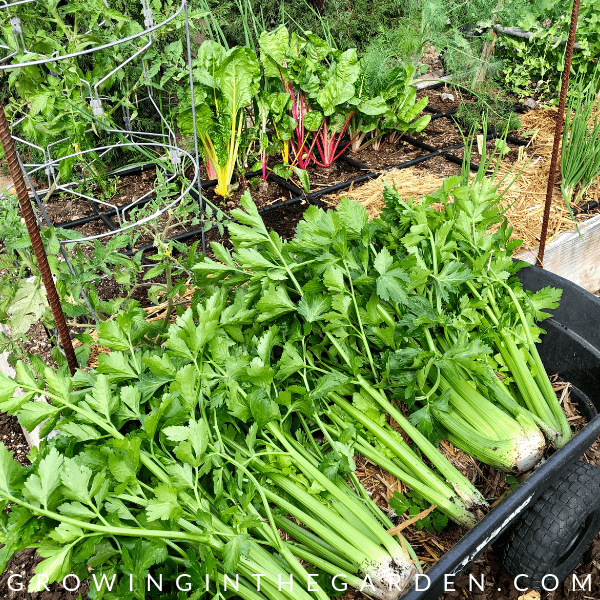 Time to harvest the celery from your garden. 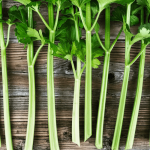 Celery doesn’t like hot temperatures and the flavor will be affected – it will become bitter. The celery will also bolt – meaning the plant’s focus turns to producing seeds. You will see a central stalk become taller and literally “bolt”. 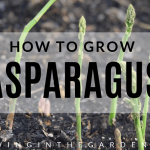 If it remains in the ground, it will flower and produce seeds. 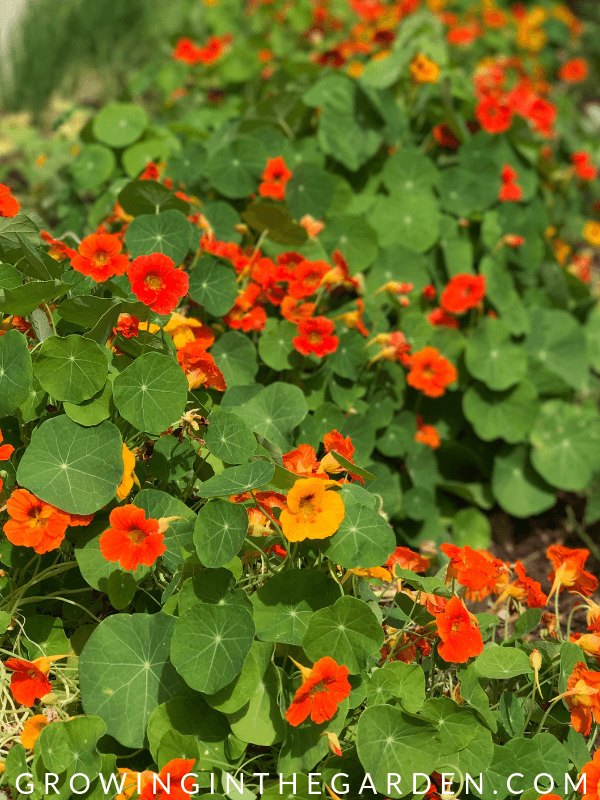 Nasturtiums put on their big show this month. The beautiful, edible blooms are everywhere! Be sure to save seeds to share with friends and family. Nasturtiums reseed easily and once you plant them, they often return year after year. 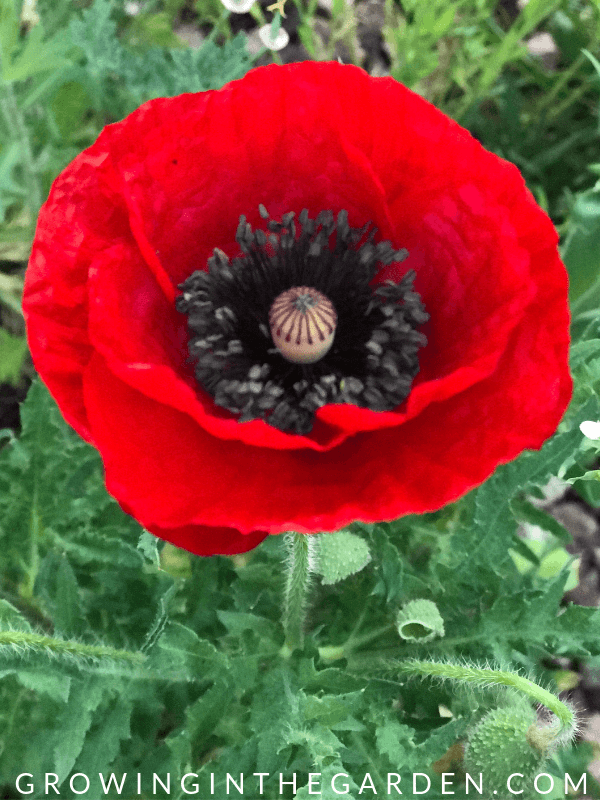 Poppies sown in the fall are beautiful. 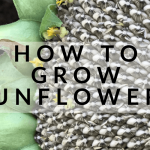 Be sure to save seeds from your favorite blooms. 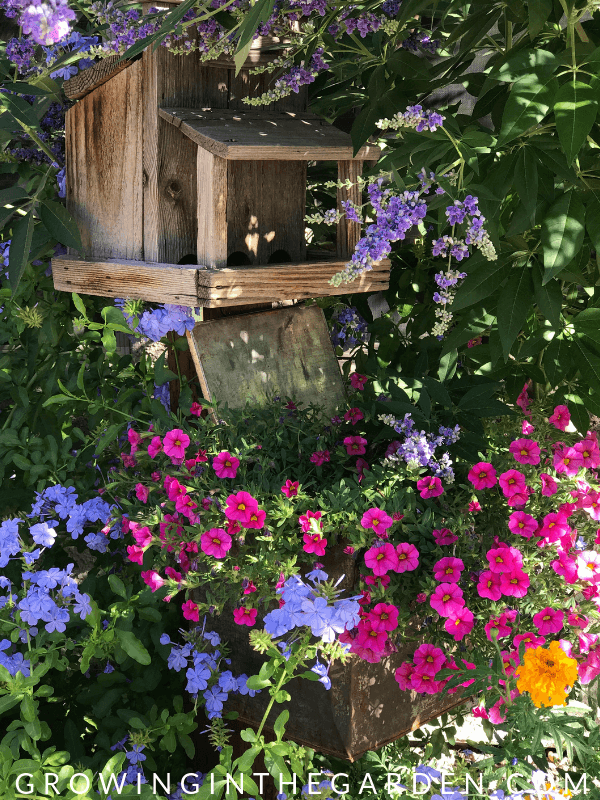 Pictured here are Vitex (chaste tree), petunias, and blue plumbago – all of which bloom and are beautiful in Arizona gardens in April. Harvest Rio Red Grapefruit (pictured here) beginning in December, up until the heat of summer. Take advantage of citrus season by juicing citrus. Juiced citrus stores well in the fridge for several weeks, and can be frozen for several months. This article shares my best tips for juicing citrus. As blossoms become fruit on your fruit trees, fruit should be thinned before it is an inch in diameter. Thin fruit within about a month after full bloom. Fruit thinned later than this lessens the chance that fruit size will increase. For more information, read this article. 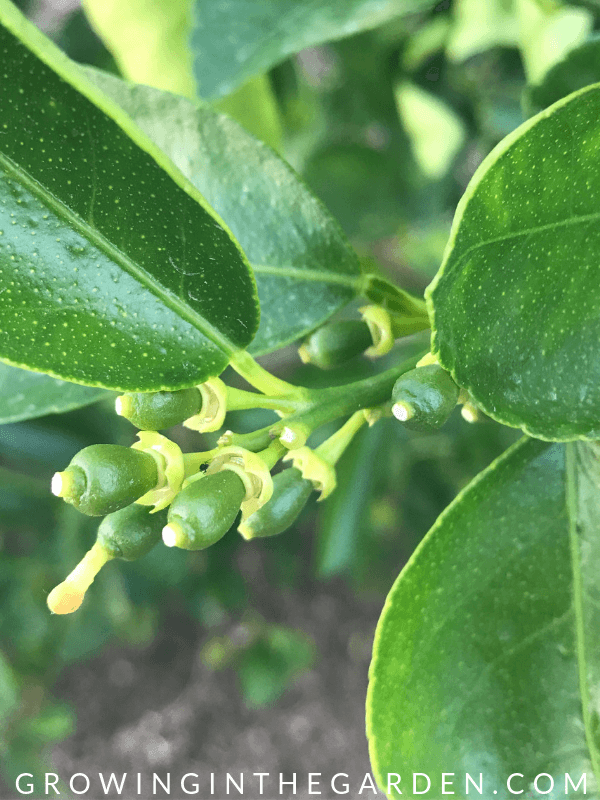 April is a good time to plant citrus in Arizona. Choose the correct variety for the location and your tastebuds. 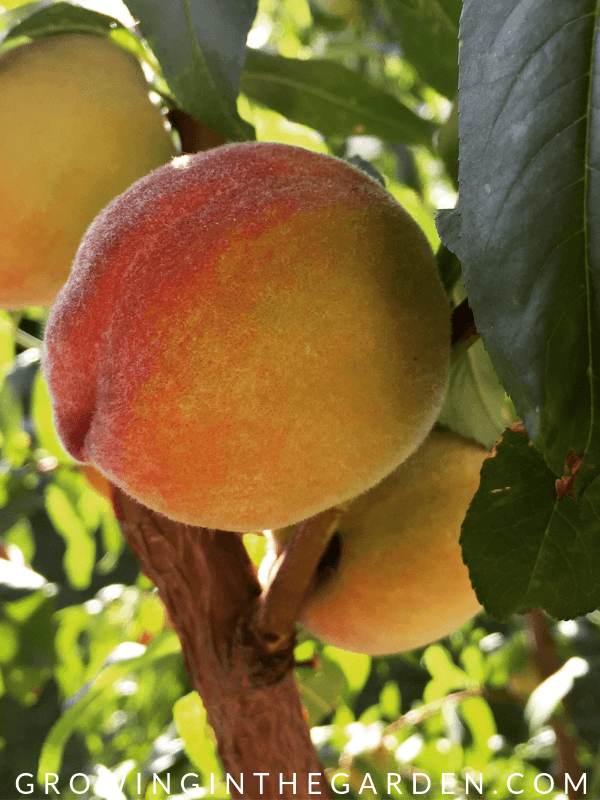 Early-ripening peaches (such as Earligrande, pictured here) may be ready to pick this month. Big delicious fruit is the benefit to all that thinning you did. Enjoy the fruit of your labors, and pick them before the birds get them! 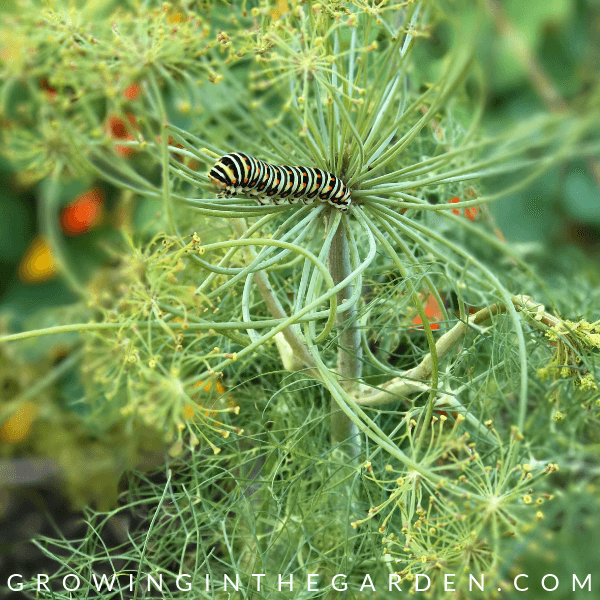 Flowering dill attracts pollinators and is a great companion plant to many vegetables. 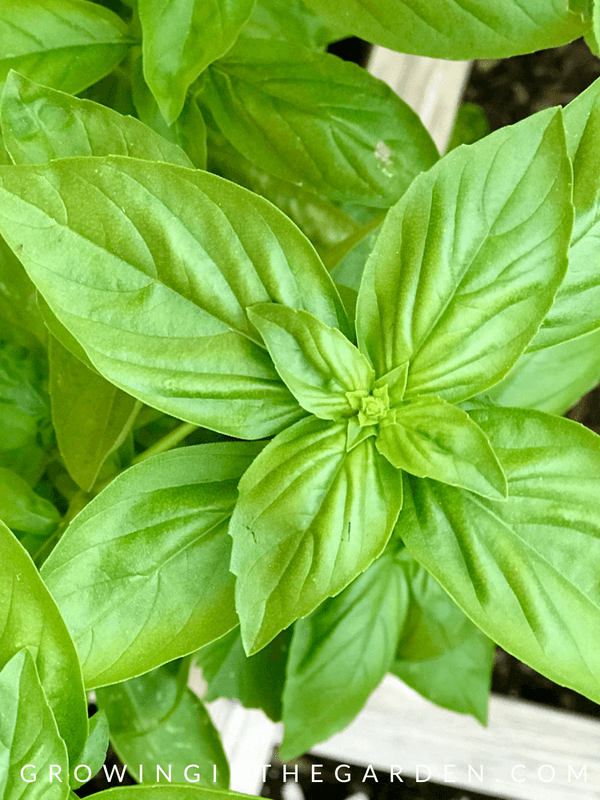 Consider planting basil next to each tomato plant. 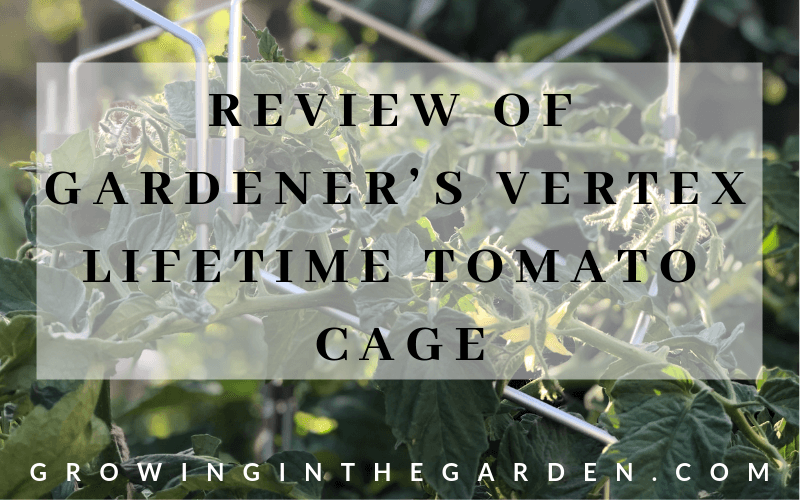 The bees and your tomatoes will thank you. 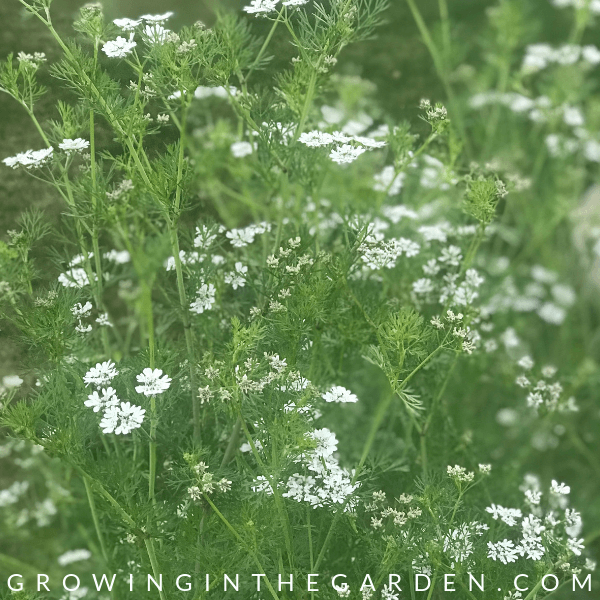 Cilantro bolts and flowers this month. Save seeds (coriander) to plant again and use in cooking. 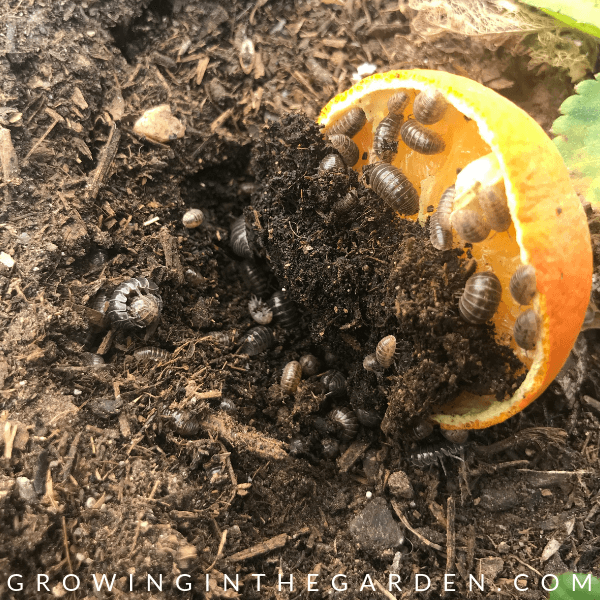 Potato bugs are active this month. Click on the picture for tips on managing them organically. 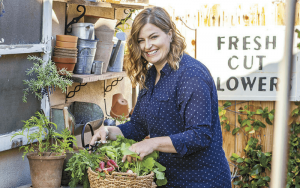 April is a good time to plant citrus trees and fig trees. Fruit trees can be planted early in the month so they have time to settle in before the heat of the summer. 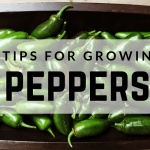 Look for varieties which require less than 400 chill hours, have early maturing fruit, and are self-pollinating. Plant cold-tolerant trees, bushes, and perennials as well as frost-sensitive plants such as lantana and hibiscus. Plant summer-flowering shrubs. Do not over-plant, be aware of mature size of plant, and space accordingly. Think twice before planting cool-season annuals this month. It will be heating up soon and their time in the ground will be short. Better to plant warm-season flowers when they are available. Check irrigation system and timer. Run system, and inspect all drips and sprinklers for leaks and proper watering. As temperatures heat up, annual plants will need more frequent watering. 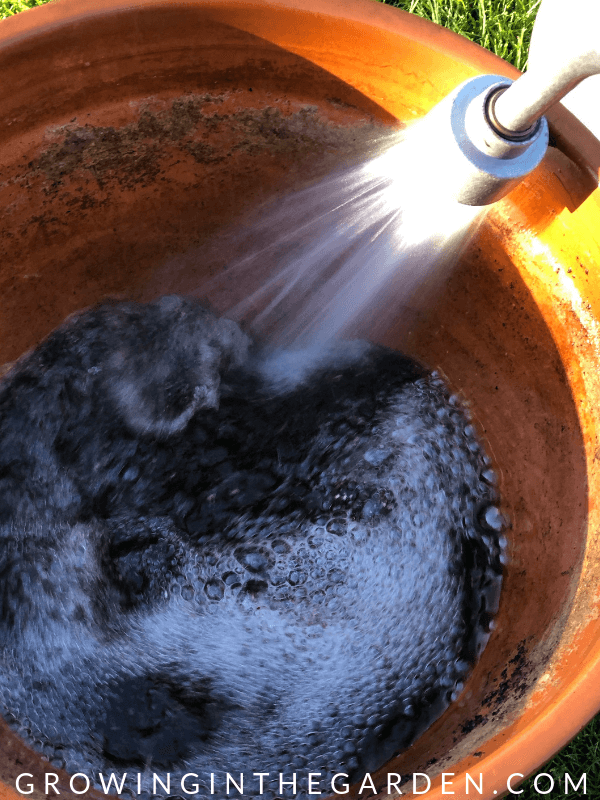 Water to a depth of about 6 inches, and allow top of soil to dry out before watering again. 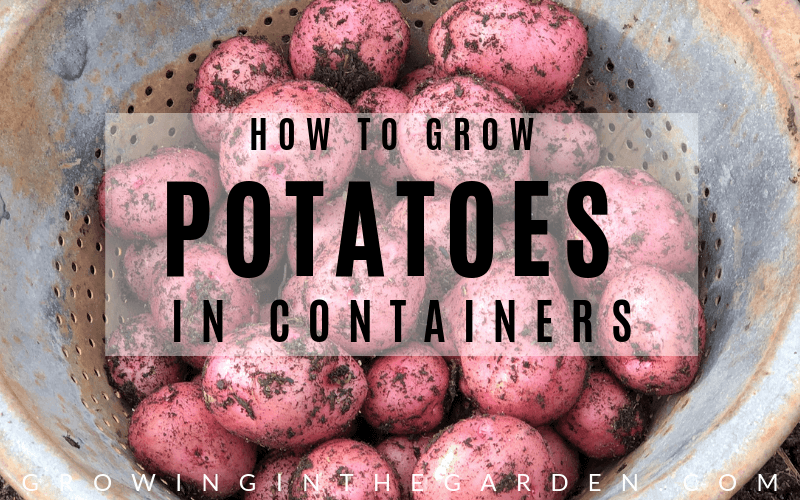 Check containers with a moisture meter or make sure top inch or so of soil has dried out before watering. Established citrus trees should be watered once every 10-14 days. Water established fruit trees once every 7-10 days. Wateruseitwisely.com is a helpful resource for landscape watering guidelines. Prune dead branches out of trees and shrubs. Spring-flowering shrubs can be pruned lightly after they bloom, water well after pruning. 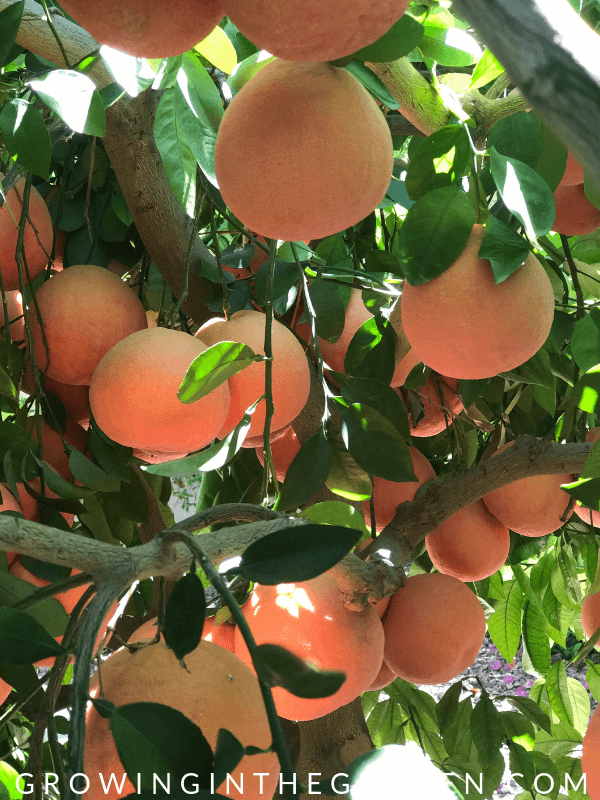 If you didn’t do it in March, clean up and remove dead or damaged wood and crossing branches on citrus. Remove water sprouts from lemon trees. Train pomegranates to a wall or prune to a manageable size. Don’t prune newly-planted trees or shrubs. Do not prune lavender, rosemary, sage or thyme. Prune basil, lemongrass and mints. Prepare soil for planting by adding compost. Do not fertilize newly-planted trees or shrubs. Fertilize trees and shrubs in your yard as needed. Native trees and shrubs do not require extra fertilization. 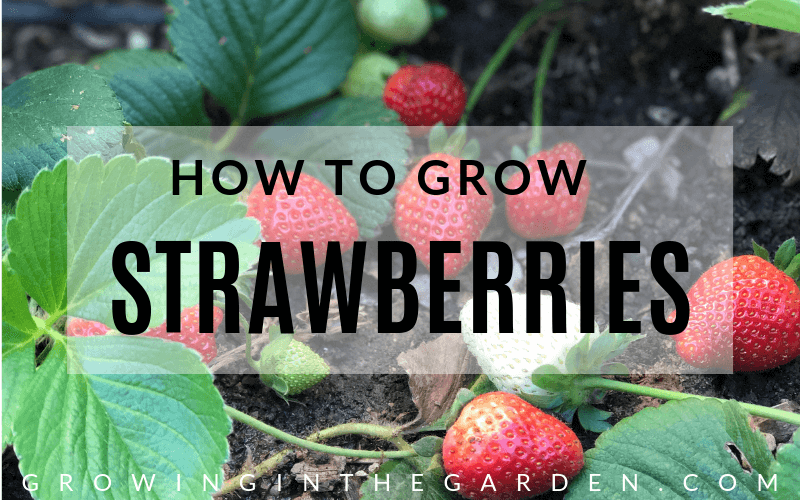 Strawberries and garlic this month should be fertilized this month. Newly-planted grapes should be fertilized this month. Feed established grapes in February and May. Clean out pots and containers. 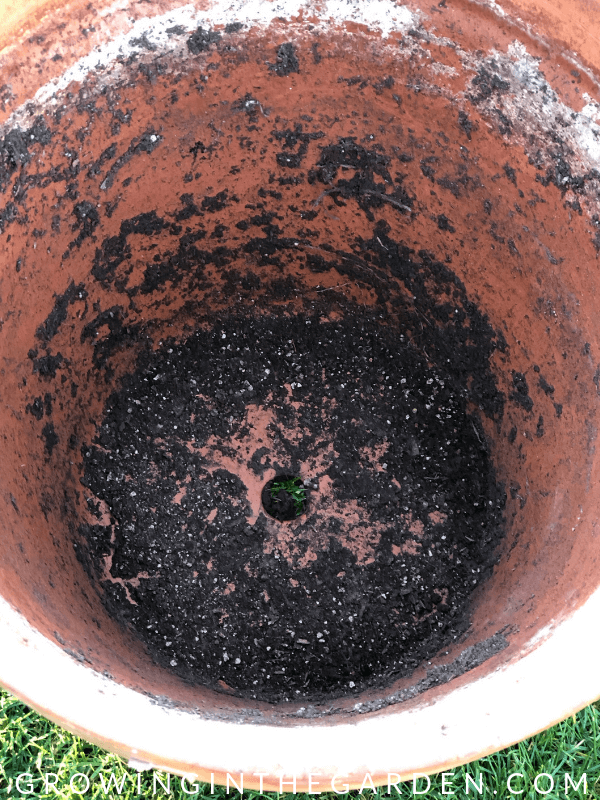 Add spent potting soil to compost (unless disease was present) and refill with new potting soil. If you do not want to replace all of the soil, try to replenish at least half of the soil. 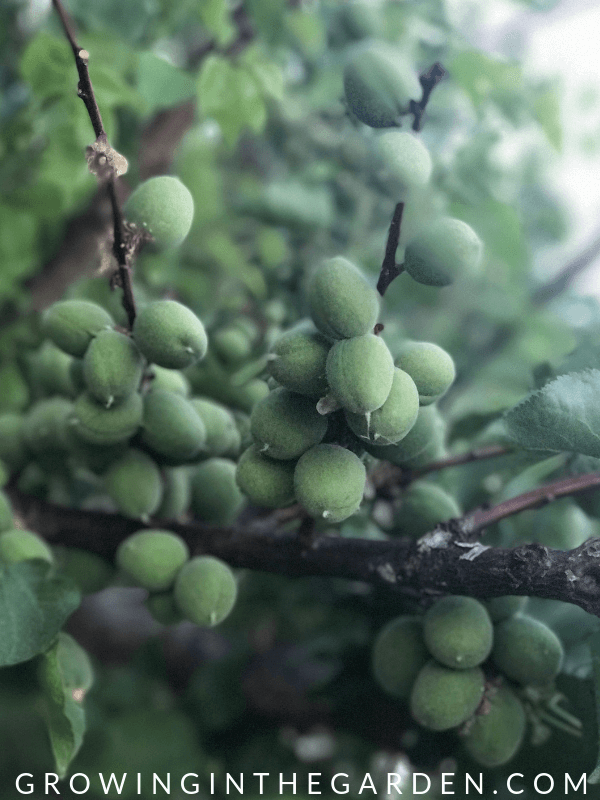 Thin fruit on deciduous fruit trees. 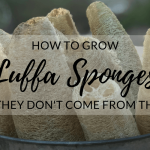 This article will help explain the process. Clear out remaining cool-season vegetables. Collect seeds from spring wildflowers and cool-season annuals sown in October and November. Remove spent winter-growing annuals. Stressed plants attract pests. 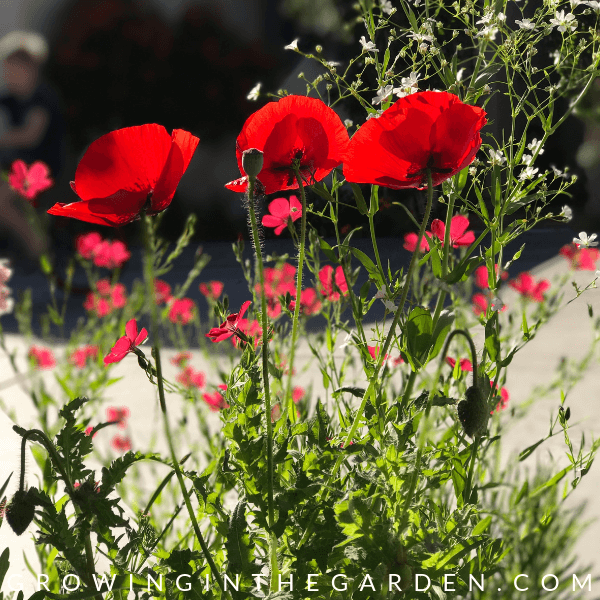 Thin warm-season annuals to keep plants from overcrowding each other. Clean up and remove dead or damaged wood and crossing branches on citrus. If you did not do it back in March, remove dead plants in yard. Look at landscape, and make note of how plants look and their performance. Apply a 2-3 inch layer of mulch around base of shrubs and trees. 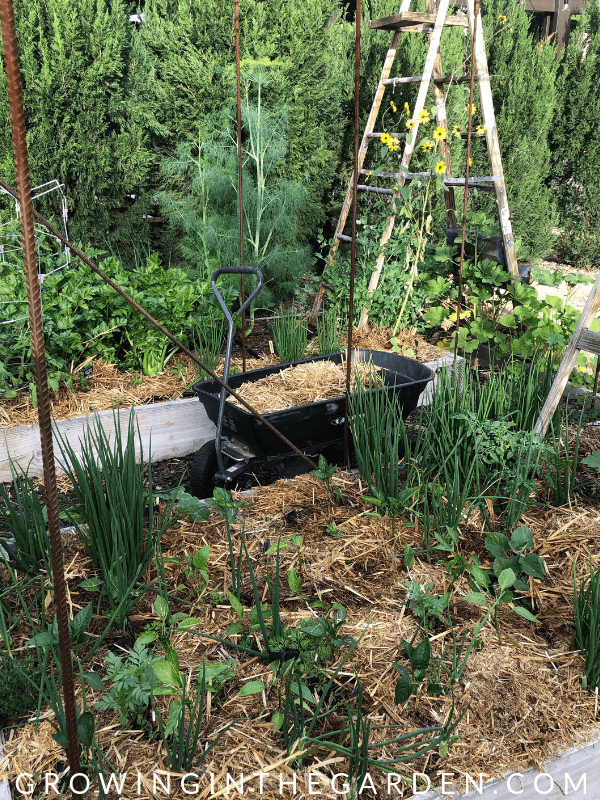 Mulching reduces soil temperatures and adds organic matter to the soil. 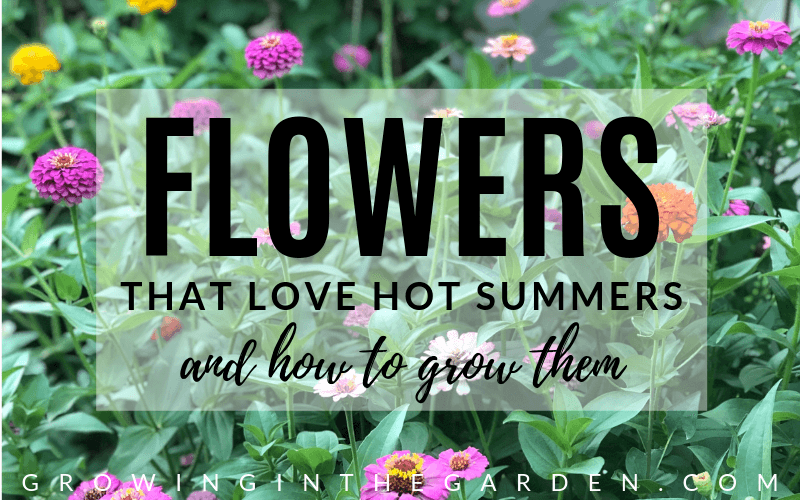 Looking for tips for growing flowers in the hot summer months? This article will help.